Climb Cho Oyu - At 26,906' /8201m, Cho Oyu is the sixth tallest mountain in the world and one of the famed fourteen 8,000 meter peaks. It is the perfect first 8,000 meter peak for many climbers, and the ideal training peak for those planning a future attempt on Mount Everest. Alpenglow Expeditions Rapid-Ascent climbs are an entirely new way to approach big-mountain expeditions. After 15 years of guiding expeditions all over the world, including more than a dozen 8,000-meter peak expeditions, we have refined and distilled the acclimatization and climbing process to maximize safety, health, success, and enjoyment. There are a number of reasons why we recommend 26,906′ (8,201m) Cho Oyu as your first 8,000 meter peak. To begin with, the route is of a reasonable difficulty, with few technical sections. Second, the route has limited objective dangers as compared to other 8,000-meter peaks. There is limited risk from rock and icefall, and avalanche conditions tend to be rare and when they occur, predictable. And third, the mountain experiences much better weather than other “easy” 8,000 meter peaks in Nepal and Pakistan. This means we can spend more time climbing and acclimatizing and less time sitting in storms in tents. The mountain is also stunningly beautiful, has incredible views of both Tibet and Nepal from the climb and its summit, and our expedition gives us a taste of both Nepal and Tibet en route to and from the peak. It is also an excellent 8,000 meter ski peak for experienced and fit big-mountain skiers. Contact us to discuss this option. Despite all of these reasons that make Cho Oyu the “easiest 8,000 meter peak”, it should not be underestimated. We require a significant amount of experience from each of our team members to ensure that you will feel comfortable on the peak, both with your own skills and of those of your teammates. Alpenglow Expeditions ensures that the logistics, guiding and base camp staff, food, and equipment are of the absolute highest-level possible. 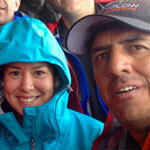 Alpenglow’s 8,000 meter peak expeditions are organized and led by IFMGA guide, Adrian Ballinger. 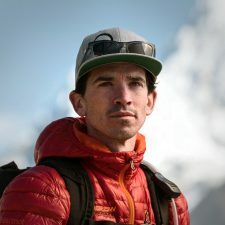 Adrian is one of the most recognized guides in the Himalaya, and the pre-eminent American high-altitude guide (the only US guide with both AMGA/IFMGA certification and more than ten 8,000-meter peak summits). 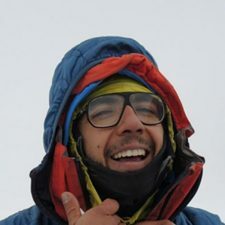 Adrian has an impeccable safety record, eleven 8,000 meter peak summits all while guiding or rope-fixing for guided teams, and has guided more than 50 clients to the summit of Mt. Everest over his past 6 summits). 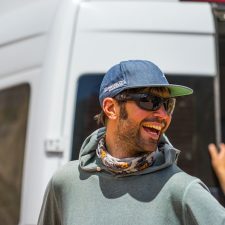 Adrian also has extensive experience organizing complicated logistics for large Himalayan teams (including 6 years as lead guide for one of the Himalaya’s largest companies), as well as countless hours on the mountain rope-fixing with sherpa, guiding members, and assisting and organizing rescues. Alpenglow Expeditions offers a small team, low ratio, high-end approach to 8,000 meter peak guiding. Beware of cut-rate operators on Himalayan peaks! It is not possible to offer quality staff, equipment, and food for less. We are also the leader in offering rapid-ascent trips to 8,000 meter peaks, utilizing pre- acclimatization and more Sherpa and guide support than anyone else in the industry. 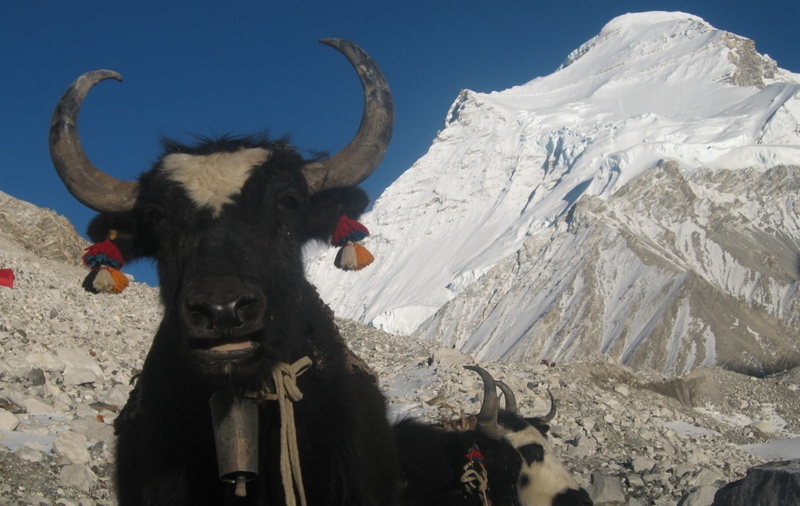 This allows you to climb and summit Cho Oyu quickly and safely. 4:1 maximum guide to climber ratio. All guides are IFMGA qualified or aspirants working towards finishing their certification. This is the lowest member to guide ratio in the Himalaya. 1:1 sherpa to climber ratio. 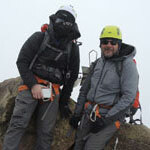 This ensures we have the sherpa necessary to carry loads, set camps, and assist climbers. All of our lead and personal sherpa on Cho Oyu are Nepali, and have worked with us on many expeditions to other peaks including Everest and Ama Dablam. They are assisted by local Tibetan sherpa for carrying loads and setting camps. Experienced expedition doctor Monica Piris (12 x 8,000 meter peak expeditions) works with the group throughout the expedition. Dr. Piris also works with each member on his or her pre-acclimatization program. Swiss weather forecasts. 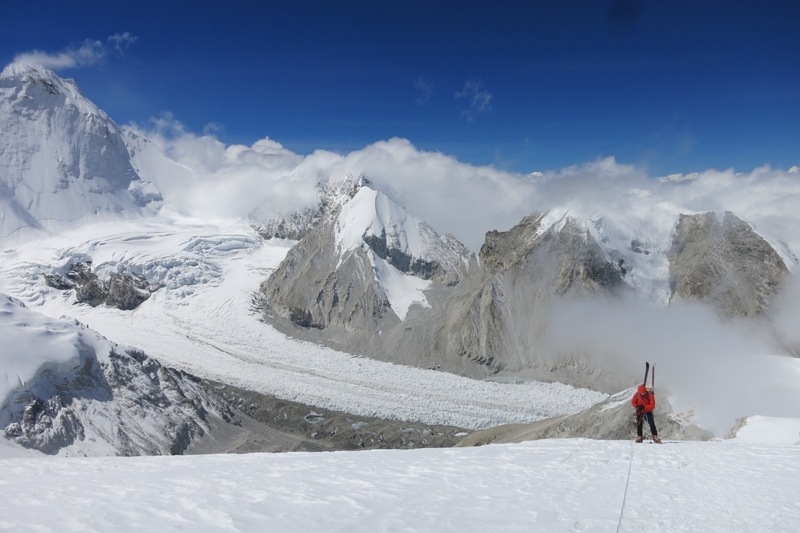 Having a quality forecast tailored to Cho Oyu maximizes both our safety and our summit success. 4 bottles of oxygen per climber. This allows us to use oxygen climbing to and at our highest camp, and to climb to the summit on a higher flow than other expeditions, ensuring safety and maximizing success. Our Sherpa also climb on oxygen on summit day (unusual on Cho Oyu), which means they have more strength and comfort to focus on you and your ascent. Imported and local foods of the highest quality, combined with a western trained cook staff. Alpenglow has the best food on the mountain, ensuring your strength and health throughout the expedition. Unlimited WiFi Internet in advanced base camp. Our focus on technology allows you to stay in touch with home and office via email, text message, and phone at no additional expense. Pre-acclimatization using Hypoxico Altitude Training Systems. A four-week rental is included in the expedition price, and use of the system is a requirement for joining our expedition. Contact us to discuss a more traditional “slow-acclimatization” extension to our Cho Oyu Expedition if preferred. Our climb of Cho Oyu begins after arriving in Base Camp (15,750 feet/4,800 meters) via 4wd Landcruisers. The drive from Lhasa is a couple of days, but goes through stunning scenery as we move through the Tibetan Plateau. We spend a day in Base Camp, organizing equipment to go up the mountain. Our pre-acclimatization means this drive and BC time takes only 2-3 days, instead of a week or more. With each member pre-acclimatized, we move from Base Camp to Advanced Base Camp (ABC) in one day. ABC is actually where we spend most of our time on Cho Oyu and our camp, perched in a glacial moraine at 18,530 feet/5,650 meters, is comfortable and sunny, and is the home of our full Alpenglow infrastructure – heated dining tents, fully stocked kitchen, heated communications and hangout tent, internet access, and much more. After some necessary rest and acclimatization hikes around ABC and to the nearby Nangpa La (a famous glaciated pass that leads into Nepal and is often traveled by local traders) we move to Camp 1 (21,000 feet/6,400 meters). The climb to Camp 1 begins easily by following the morainal valley to a small lake, before climbing steeply up a challenging scree slope to camp in a protected bowl on the glacial ridge. We spend at least 3 nights in Camp 1. During this time we also make an acclimatization climb over the short but challenging ice cliff (a steep 20-30 meter climb of firm ice on fixed lines), and across broad glaciated slopes to Camp 2, at 23,000 feet/7,000 meters. We do not spend a night in Camp 2, since we will utilize oxygen above this altitude on our summit push. After this climb to Camp 2 we descend to ABC for rest and to prepare for our summit push. 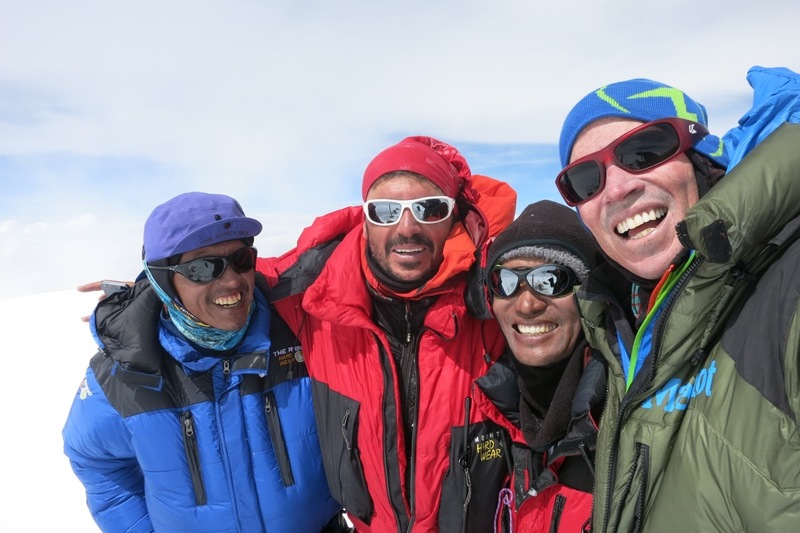 Our final ascent utilizes Camp 1, Camp 2, and a Camp 3 at 24,250 feet/7,400 meters). We climb to, and sleep at, Camp 3 on supplemental oxygen to ensure we are strong and healthy on summit day. The climb to the summit begins with the route’s technical crux, a short steep rock step. From there the route climbs thirty to forty degree snow slopes up to the summit plateau. Cho Oyu’s summit plateau is almost flat and the route traverses all the way to its far end and the true summit where we are rewarded with views of countless Tibetan and Nepali peaks, including inspiring views of Mt. Everest. From the summit we descend to Camp 2 where we spend the night, and then continue down to ABC to celebrate our summit, rest, and prepare for our return to Kathmandu and home. Must be able to climb moderate rock, ice, and snow terrain, often with an alpine pack on your back. You should be comfortable with camp craft in high-altitude camps, and able to perform at a high level for multiple days in a row at altitude. Prior ascents of multiple 6000 - 7000 meter peaks is required. 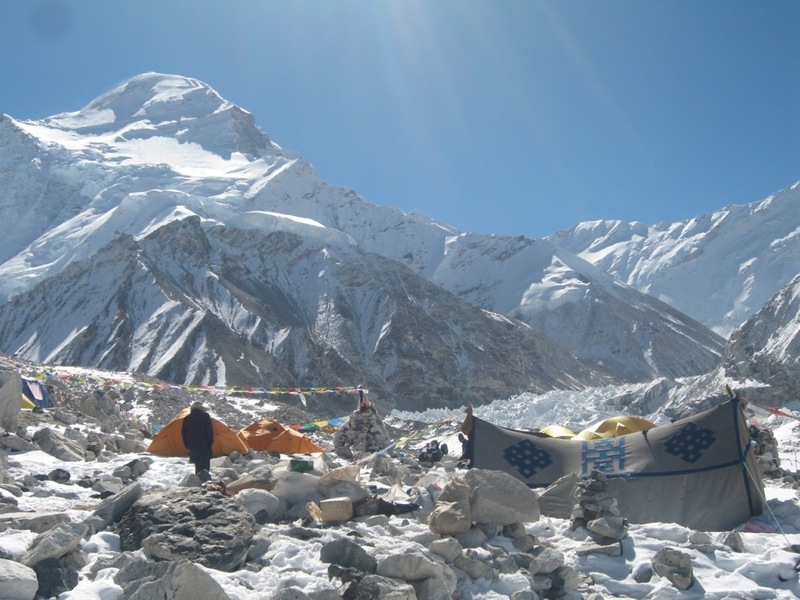 Climbers must have substantial climbing experience to join our Cho Oyu Expedition. Prior ascents of multiple 6000 - 7000 meter peaks is required. Climbers must be able to climb technical terrain with an alpine pack on their back. Climbers should also be comfortable with camp craft in high- altitude camps and be able to perform at a high level for multiple days in a row at altitude. Fly by plane to Lhasa (12,000 feet/3,650 meters). Arrive by mid-afternoon at the latest. From the airport it is an hour drive into Lhasa, where we have a bit of time to walk around the old city, and enjoy a traditional Tibetan dinner. Climbers are responsible for all flights. Day 2 — Visit the Potala Palace and Jokhang Monastary, drive to Shigatse (12,500 feet/3,800 meters). The Potala Palace, former home of the Dalai Lama, and ancient Jokhang Monastary, are two of Tibet’s most important cultural sites, and imperative to beginning to understand this unique place. After a morning exploring with our local guide, we drive a few hours along the now paved road to Everest, stopping for the night in Shigatse, and our simple but clean hotel. Day 3 — Drive Shigatse to Cho Oyu base camp (15,750’/4,800m). Arriving in base camp we’ll unload the vehicles and get some rest. We spend a day in basecamp resting and organizing gear in preparation for our push to advanced basecamp tomorrow. ABC is actually where we spend most of our time on Cho Oyu and our camp, perched in a glacial moraine at 18,530 feet/5,650 meters, is comfortable and sunny, and is the home of our full Alpenglow infrastructure – heated dining tents, fully stocked kitchen, heated communications and hangout tent, internet access, and much more. After our move yesterday we'll need to rest a bit and prepare for moving higher. Our exact climbing plan depends on numerous factors, including weather, route conditions, and our level of acclimatization. We make a few cycles on the mountain, climbing at least as high as 23,000 feet/7,000 meters, before attempting our summit push to the top of 26,906' Cho Oyu. Across the Tibetan Plateau we travel, eventually ending up back in Lhasa. Team members catch flights for home. Would you consider doing a custom expedition to Cho Oyu? We always consider customs expeditions. Custom trips make up more than 50% of our groups. Contact us to begin the conversation. What sort of experience is needed for Cho Oyu? 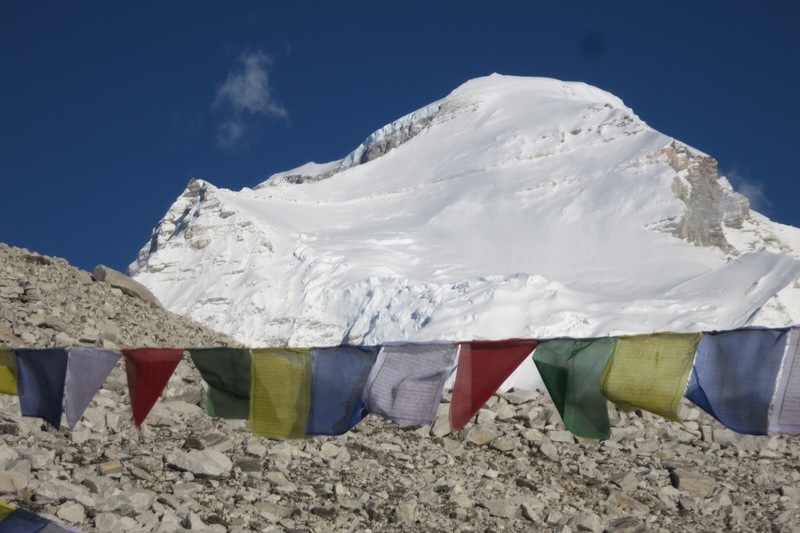 In order to join our Cho Oyu expedition, climbers must have experience on an 7000 meter peak. Many climbers gain this experience by joining our expedition to Aconcagua. 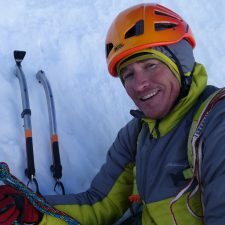 Climbers must have solid ice and snow climbing experience, including the use of ice axe, crampons and fixed rope systems. The Puja Ceremony – Everest Commencement!